Rain. It's been happening a lot lately. It literally puts a damper on summer fun, but there's a way to make the best of it. I always find myself craving soup even when it's not winter. Summer is usually reserved for light and fresh soups, sometimes cold ones, featuring seasonal produce. 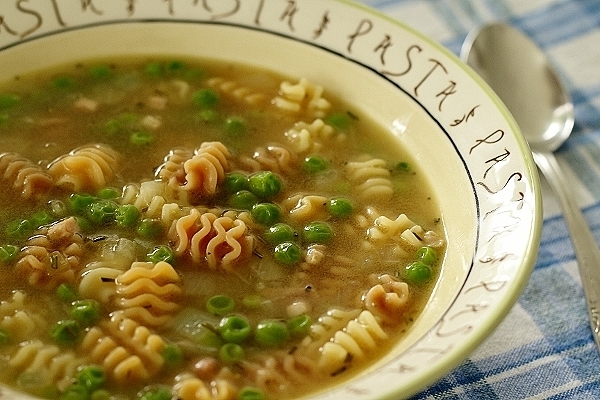 Even when it's hot, soup can find it's way into your meal plan if you play your cards right. 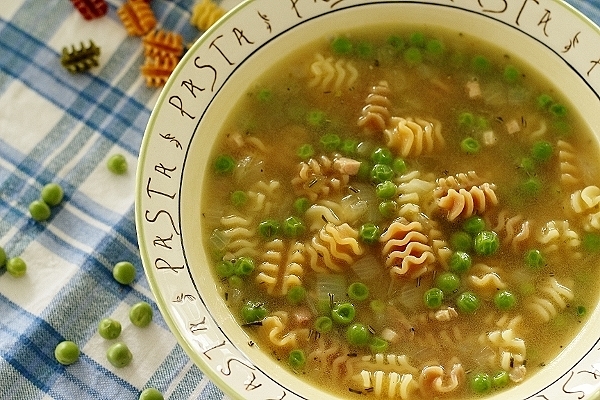 Right now, fresh peas are on their way out, but it's not too late to find some (I did)! 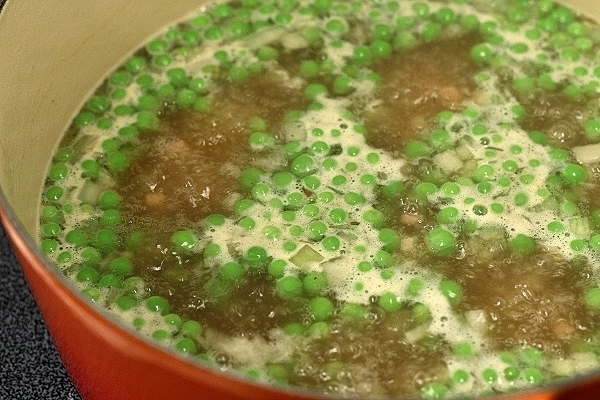 And if all else fails, frozen peas work in a pinch. I use them year round, but was really excited for the opportunity to make my rainy day soup with fresh peas this time around. 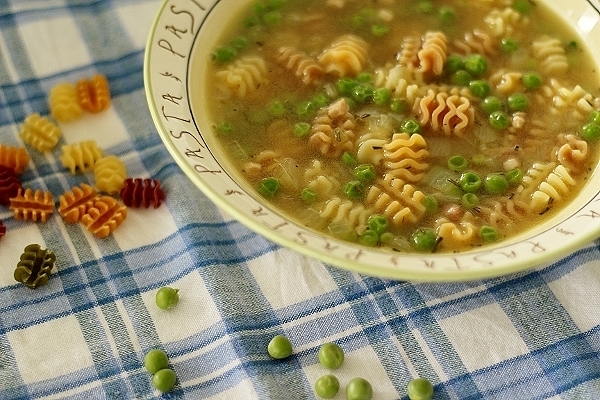 I had been eyeing a particular soup in The Glorious Pasta of Italy by Domenica Marchetti ever since I reviewed her cookbook a couple years ago. A blogger friend of mine (Megan at Delicious Dishings) had featured it as well when she reviewed the book and I quickly added it to my list to try at some point. Soup seasons came and went, and for whatever reason it took this long for me to try it (did I mention I own HUNDREDS of cookbooks which I often feel I'm neglecting? I need to be a better cookbook parent and give them all their fair attention--I'm trying!). With a series of storms in the region and the availability of fresh peas, I was ready to rock and roll. A trip to Trader Joe's later, I had discovered some organic vegetable radiatore pasta which, although larger than the pasta typically used in here, would be a colorful and welcome addition to this soup. And since my pasta was a bit larger than ditalini or shall shells, I decided to measure it by weight instead of volume because it would take up more room in a measuring cup. 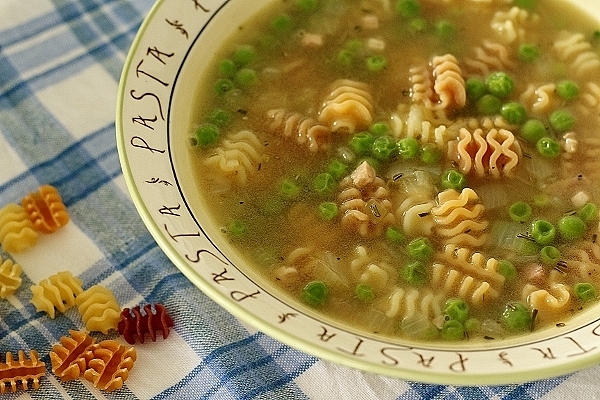 This soup is perfect for a quick soup craving. It takes very little time to cook and is full of fantastic flavors! 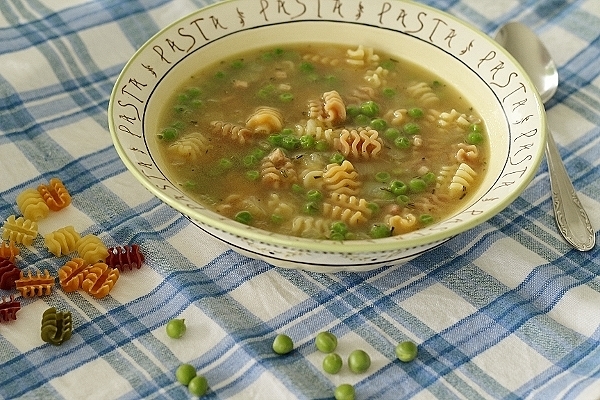 Between the meaty pancetta, tender onion, fresh herbs, sweet green pearls still reminiscent of spring, slight bite from the pasta, and nutty and salty cheese which adds an unctuous mouthfeel to the light broth, this soup packs a punch for minimal effort. Warm the butter and olive oil in a Dutch oven or other heavy-bottomed pot placed over medium heat. 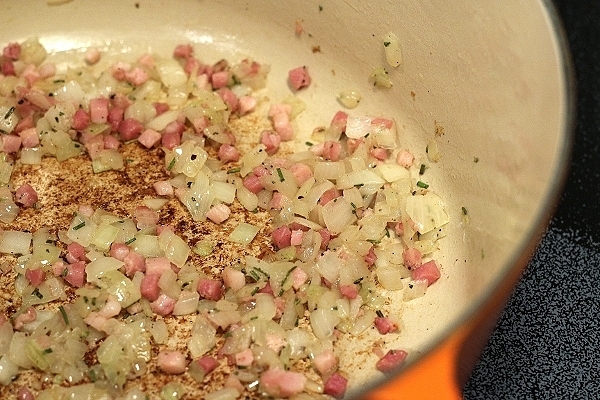 When the butter is melted, add the onion and pancetta, stirring to coat them thoroughly. Saute for five minutes, reducing the heat to medium-low if needed to prevent the onion from burning. Sprinkle in the marjoram and a generous grind of pepper and continue to saute for another five minutes, or until the onion is translucent and the pancetta has just begun to crisp but is still mostly tender. Pour in six cups of the broth; raise the heat to medium-high to boil. Toss in the Parmigiano rind (if using). 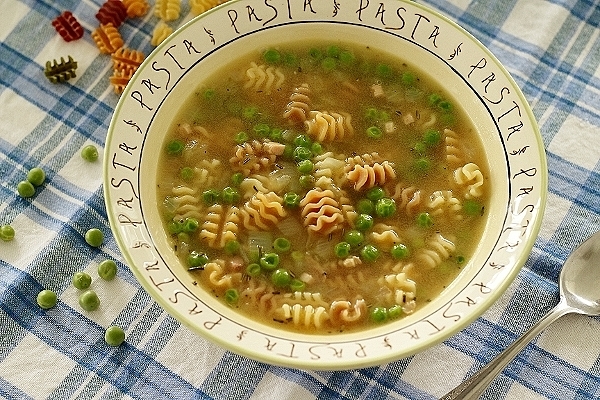 Stir in the pasta and peas, using 1 1/2 cups for a soupier soup and 1 3/4 cups for a thicker soup. Cook until al dente (the cooking time will depend on the brand and shape). Add a splash of broth if the soup seems too thick. Remove the soup from the heat and stir in 1/2 cup of the Parmigiano. Taste and add salt and additional pepper, if you like. Ladle into warmed shallow bowls and sprinkle with the remaining cheese. Serve immediately.